When it comes to Extreme Dog Grooming, Kobe the poodle is the top dog. 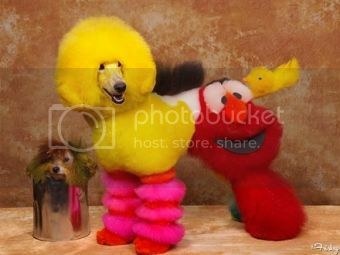 Transformed into a tribute to Sesame Street – one part Big Bird, another part Elmo with his own Oscar the Grouch in a trash can to keep him company, he won the Extreme Dog Grooming competition in Pasadena, FL earlier this year. Yes there is such a thing! Several of them of them in fact as some contests are held in Hershey, PA, Secaucus, NJ, Chicago, Atlanta and Las Vegas. In Extreme Dog Grooming contests, dog groomers come up with the wackiest, most creative styles for their dogs. They use dyes (a controversial practices), chalk, extra fur and other accessories to turn their pooches into characters from Star Wars, half tiger/half elephant creatures and other mythical figures – in other words works of pop art. For her artistic talents, Kobe’s groomer, Catherine “Cat” Opson won $5,000.00. Some contests offer as much as $30,000 is cash prizes. We have renowned animal photographer Rene Netherland to thank for these photos. He crisscrosses the country snapping pictures of these competitions to share with the world. This entry was posted in Comfortgroom, Entertainment on August 8, 2013 by admin.